Greyhounds are quite adaptable. 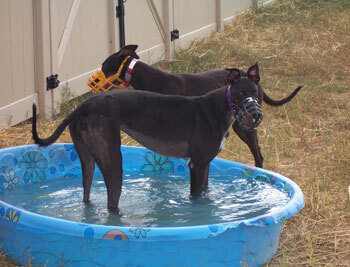 Your greyhound will love to go walking or jogging with you in addition to enjoying a romp around a fenced backyard. If you don't have a fenced yard, then they will need a couple of long walks a day to keep them happy and healthy. Many greyhounds live quite happily with well-mannered children. While greyhounds are known for their even disposition, no dog, regardless of the breed, should ever be left unsupervised with small children. Greyhounds tend to bond to their primary caregivers, usually an adult in the household. So if you are looking for a family dog that the kids want to play fetch with and chase around, a greyhound is not a good choice. Greyhounds are very social and friendly by nature. However, cats and small dogs are new to them, unless you are adopting a dog that has already lived in a home happily with them. AHH cat tests every dog and will not place a non-cat friendly dog in a home with cats. Even with cat friendly dogs, we urge caution when introducing your greyhound to other pets, and recommend muzzling your greyhound and supervising all interactions until relationships have been established. Do greyhounds make good running companions? Not really. Greyhounds are sprinters, their races last about 30 seconds. They are also highly intelligent and curious dogs and so get bored easily. And although they may be gradually trained to jog a few miles, their feet and long toes are not made for extensive running on hard surfaces. They much prefer long walks, especially with lots of good sniffing spots. Why do greyhounds need to wear a coat when it is cold? Greyhounds do not tolerate extremes of temperature very well. They have little body fat and so get cold easily. In very cold weather, they need to wear an appropriate coat if they are going to be outside for more than a few minutes. They also have difficulty in very hot weather and can suffer heat exhaustion quickly, so outside activities should be restricted to early morning or evening. Do greyhounds have to stay on a leash? For centuries, greyhounds have been bred to chase things that move. They can see up to a mile away, and reach speeds of 45 mph within seconds. They are out of earshot in 3 strides. If an unleashed greyhound is frightened or begins a chase, he or she will often run until they are exhausted and lost. Add to that their inexperience with the everyday hazards of busy roads and traffic, electric fencing, and rough terrain, and it is usually a disastrous outcome.